My Pinterest feed is filled to the brim with gorgeous miniatures day in and day out, many of them pictures of miniature food, flowers, and other items made from polymer clay. While I love to spend ages pouring over the pictures and the websites they’re from, the artisans who make them (rightfully) charge higher prices than I am able to pay for the items I so covet. Lucky for me, an awful lot of artisans, some in miniatures and some in other areas (e.g. beading and jewelry) are also willing to share their tips and techniques to allow people like me to get started without too much failure in the trial and error process. And so, here begins my journey in polymer clay! I’m in the process of working on the kitchen for the Undersized Urbanite build (man, I really need to actually come up with a good name for it – any suggestions?) 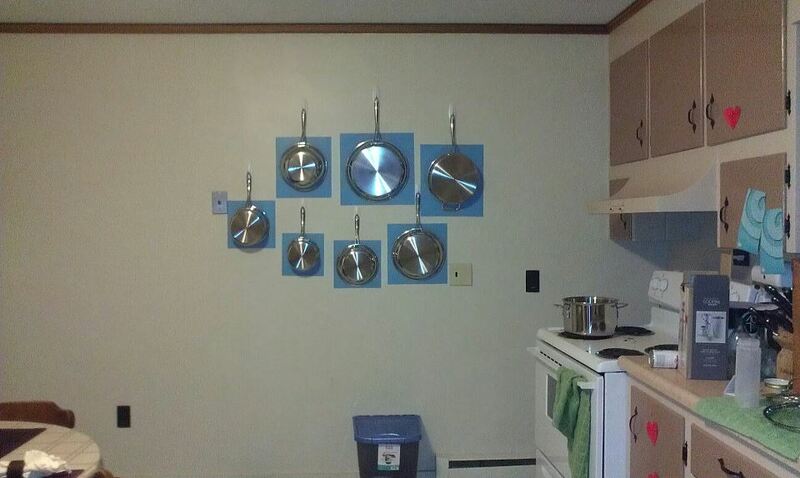 and due to the tiny size, I thought I would utilize some of the basic kitchen utensils as decor. I have actually already done this in my lifesize home, because my cookware doesn’t all fit in my cabinets, and I didn’t want to stack them because it would void their warranty. There’s blue poster board behind them since we rent and I did not want to damage the walls – that also makes the whole ensemble look like a rather nice modern art installation, even when dirty pots are missing! As I was musing for items I could feasibly utilize for decor in the tiny house, Christina at the Little Victorian posted this update to her home kitchen, inspired by photos from Houzz. Both my mother and grandmother occasionally hung cutting boards up in the kitchen, and it all just clicked into place. That said, finding nice miniature cutting boards is far easier said than done. If I actually made them out of wood, the ultimate product would not look nearly so nice with the materials I have in store. 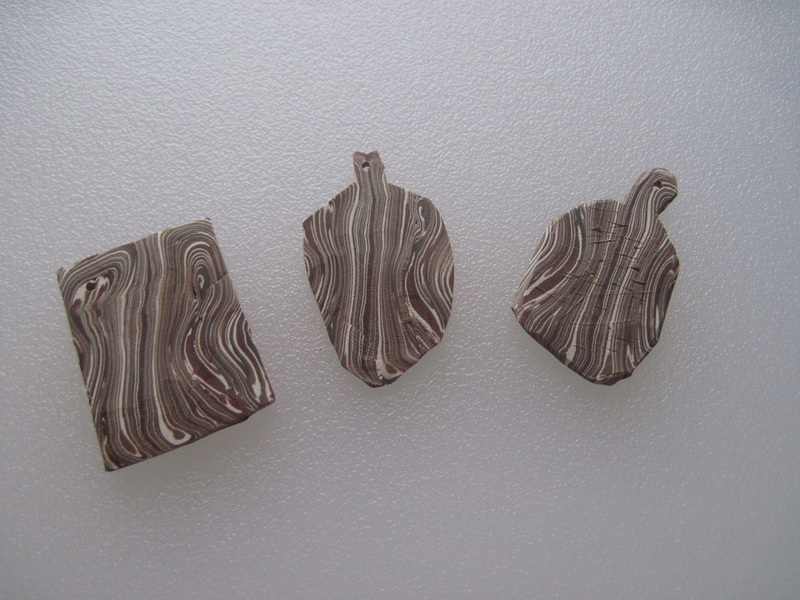 They are modeled after my favorite olive wood cutting boards which my aunt introduced me to. I’m a little undecided if I am going to actually use these, or if I’ll have another shot at it. I cut the white clay with some brown, but did not think it would stand out quite so much – so we’ll see what the final decision is! If I decide to stick with them, in all likelihood I’ll only use one. I’m with my family celebrating Thanksgiving today (and writing this post in advance – don’t worry, I really am spending time with them!) and wanted to recount some of the things I’m thankful for right now that are specifically miniatures-related. I hope you have a wonderful holiday – and if you are not a celebrant of the US Thanksgiving weekend, I do so hope you have a wonderful weekend! I haven’t had much time to work on my own minis lately, let alone document progress, but I wanted to share a fun find from running errands the other day. 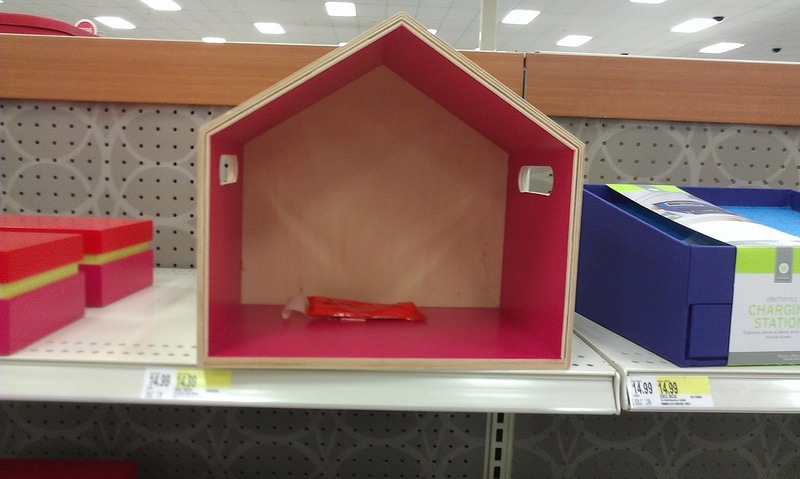 This immediately jumped out at me as a “quick and easy” roombox base, or even a small dollhouse (1/2″ scale would work pretty well – or even as a toy dollhouse for some Calico Critters!). If you’re interested in starting in miniatures but don’t know where to start, or if you’re just looking for your next minis project – this would make a pretty great start! The shelf itself even comes with hardware for wall-mounting. I was SO tempted to pick one up, but I really couldn’t justify the purchase that day with all the projects I’m already working on. I haven’t given up on Pico Life, nor the Undersized Urbanite contest, but life has been busy and I’ve been in need of serious thesis work 🙂 Add that to the fact that my husband set up a new Minecraft server and…well, I’ve been spending a fair bit of my free time geeking out, haha! I’m hoping to get a good full-home update done soon, but in all honesty I’m not entirely sure when that will be. 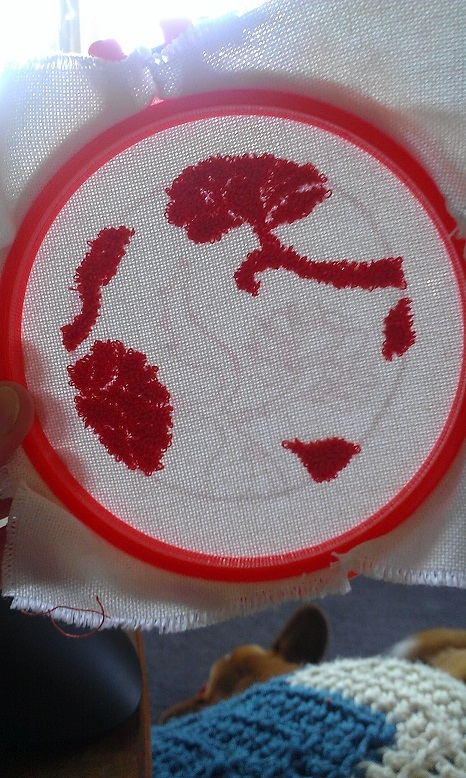 I am, however, still making progress, even if I haven’t had time to document it here. Electricity and the kitchen are my current goals for the tiny home, and I’m really excited to share both my progress and my techniques here. Progress – so far – has been very quick on my Undersized Urbanite build. I’m starting to grow concerned that I’m about to hit a wall with how it’s going and have to start over, but it’s not like I don’t have 7 months to finish, right? On Monday afternoon, I painted the walls and laid & stained the floor. 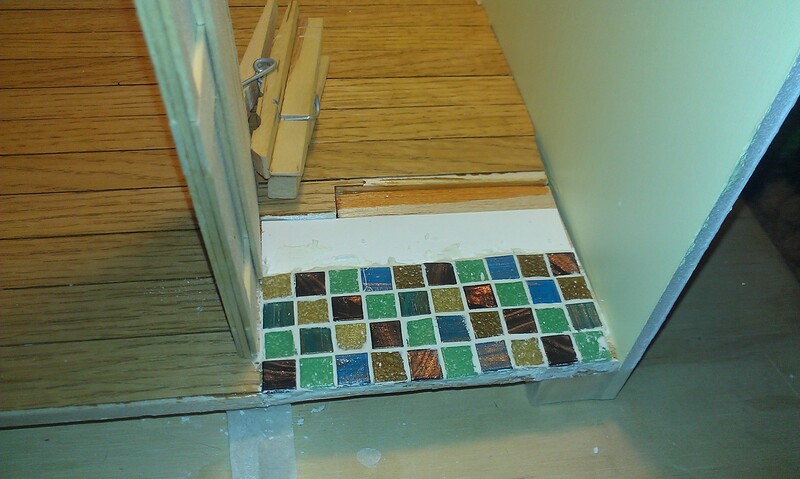 The base of the floor is quarter inch thick balsa, very easy to size and cut, and the wood plank flooring is actually iron-on veneer strips meant for cabinet edging. It’s been stained with Minwax water-based express finish stain in Golden Oak. With the actual veneer being Red Oak, staining with the Golden Oak gives it a nice strawberry-blonde finish, which will go extremely well with the decor scheme I have planned! 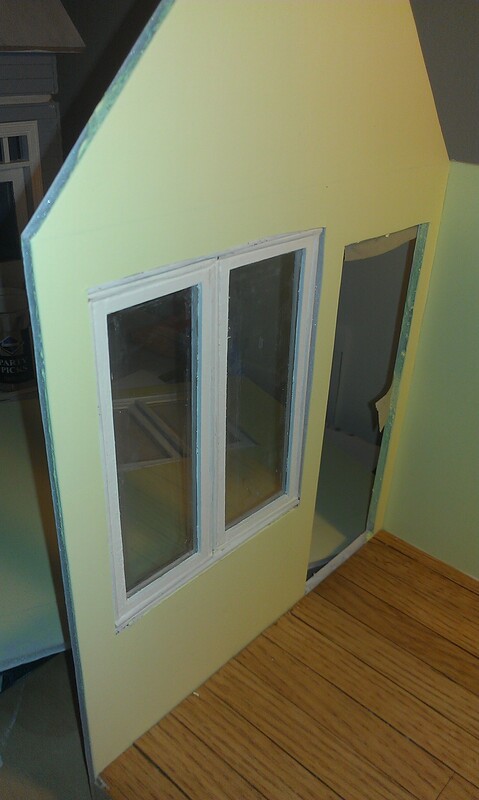 Monday night, I began to paint and install the windows, which I had already built. As you can see, the windows do open 🙂 I considered purchasing working windows, but not only was this method extraordinarily inexpensive (all of the windows came from one piece of three dollar 8×10″ plexiglass from Lowes, and trim was 29 cent stripwood from Michaels) but I didn’t have to wait for them to arrive in the mail AND I got to custom size them all. I really like the hinged openings for this build, I think they fit the character of the home quite nicely and as it all comes together I hope you do too 🙂 I still have one more small window to build out, so I hope to utilize that one to make a tutorial on my DIY hinged windows. 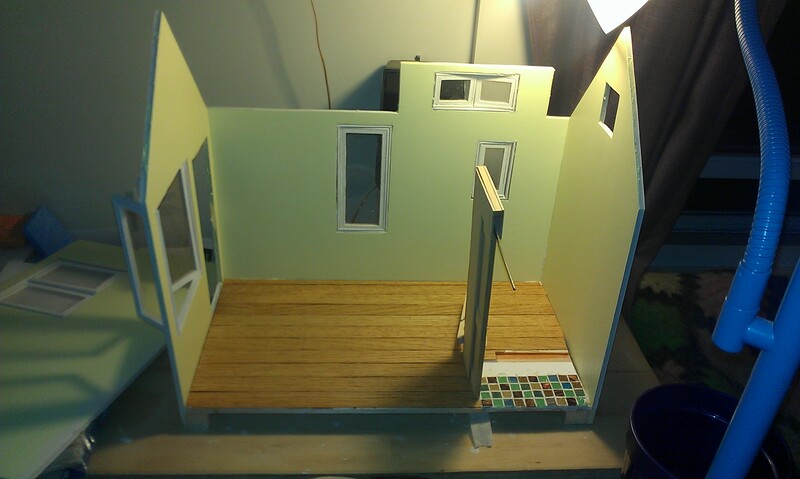 Tonight, I finished installing the windows, tiled the viewable portion of the bathroom floor, and glued the three permanent walls. I LOVE the tile colors! They’re stuck and grouted with plain old spackle. I still have some clean-up to do with them, but they really need to dry overnight first. I’ve also propped in the pocket door to see what it looks like; I love it, but it needs some revamping to actually function. There is one more wall that needs to be installed, but for now it will have to wait. 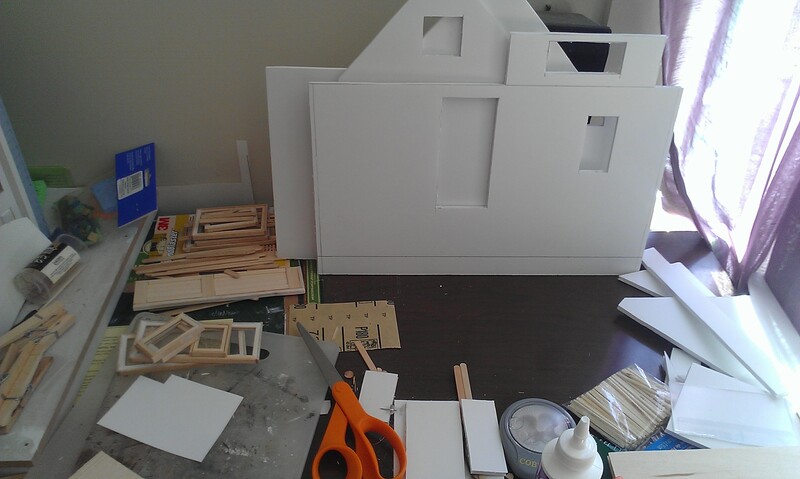 Unlike most dollhouses which have either an open side, front, or back, or a hinged side (typically the front), I’ve decided this build needs a removable wall for the full effect. 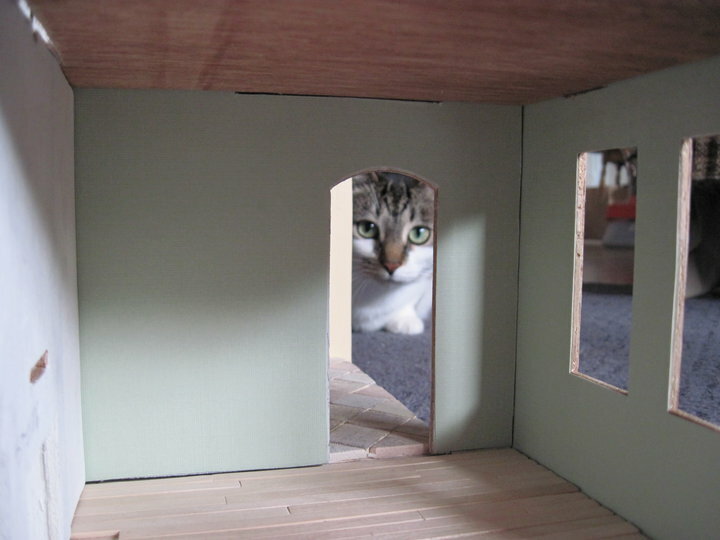 Most full-size dollhouses can get away with the open wall, and all of the rooms are essentially set like a stage for a play; with this build of a tiny house, all four walls must be used. This also means that when it comes to my final photos of my entry, I’m going to have to get creative with the photography. My next steps will be building out the kitchen cabinets and/or doing a bit of external trim and fitting the fourth wall. I haven’t quite decided yet 🙂 Lighting arrived today, so I’ll have to give that some consideration as well….but electricity will most certainly warrant its own post! For more information about the Undersized Urbanite contest, visit www.undersizedurbanite.com! Twelve hours! I can’t wait to follow all the other entrants!